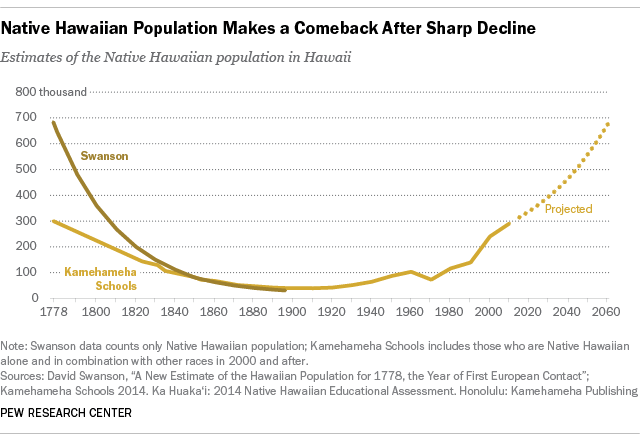 After Europeans and mainland Americans first arrived during the Kingdom of Hawaii period, the overall population of Hawaii, until that time composed solely of indigenous Hawaiians, fell dramatically. The indigenous Hawaiian population succumbed to foreign diseases, declining from 300,000 in the 1770s, to 60,000 in the 1850s, to 24,000 in 1920. While this pattern seems to be similar to the fate of earlier "discovered" peoples in Latin America, since it took place in the late 18th and mostly 19th century I'd expect there were better historical records at that point in time, begging the question: Are there good analyses of this remarkable population decline that go beyond simple explanations like "diseases"? To clarify: I do not "doubt" the "mainstream narrative", I'd like to dive deeper into it. Please provide links for research. I never intended to claim that diseases did not constitute the single most important part of the explanation, but I consider(ed) it likely that there was an interplay between diseases, politics/warfare, social mores, maybe emigration and/or slave labor, etc. I assumed that Hawaii would be an interesting exemplary case because events unfolded comparatively recently (better data/observations). I did not intend to imply that Hawaii was a singular or special case. There's nothing really odd about this. The same thing historically has happened all over the globe any time an immunologically naïve population meets up with one that is tapped into all of the worldwide reservoirs of diseases. Eventually the native population can naturally select similar genetic protections to the ones the colonizers already had, but that typically seems to take a century or more. The book Plagues and Peoples goes into the historical impact of diseases quite well, as does Guns, Germs, & Steel. I can't recommend the latter strongly enough. If this website had a required reading list, GG&S would be the first book on it. Specifically with the Hawaiians', all the sources I've found call out syphilis. Captain Cook himself (in the short time before the Hawaiians killed him) actually called this out as a problem. Note that the contact population of 300,000 you quoted is only an estimate. I found estimates researching this that ranged from 100,000 to 1 million. The good news (?) is that the native population is now on the rebound, and has either passed the pre-contact population, or is poised to do so (depending on which estimates you believe). * - King Kamehameha II and Queen Kamamalu, showing a distinct lack of patience, took a trip around the world to England so that they could both die from Measles a decade earlier than their subjects. Question : Are there good analyses of this remarkable population decline that go beyond simple explanations like "diseases"? I was going to just leave a comment, but decided against it to heed – Mark C. Wallace's policy reminder above. As @T.E.D. stated in his fine answer, the pattern is common. It occurred in South, Central and North America; as well as in Hawaii and other isolated islands in the south pacific. When European(Eurasian) cultures first encounter non Eurasian peoples; the result is a large die off due to diseases which the Europeans have built up immunity too, and which the indigenous people haven't. North American Indians, Aztecs, Incas and many South Pacific Islands(Hawaii, Samoa, Fiji) all followed this pattern. For a non trivial general review of the phenomena see the 1998 Pulitzer Prize winning, and Royal Society's Rhône-Poulenc Prize for Science Books; "Guns, Germs, and Steel", by Jared Diamond. In the beginning of the book Diamond is asked by a South Pacific Native friend why European Nations were so successful in colonizing other peoples, and this book was his answer. Diamond didn't invent the theories he discusses but he was the first to put them all together in a comprehensive fashion and explains them well. For a non trivial review of Hawaii specifically I would recommend James A. Michener historical fiction books "Tales from the South Pacific"(pulitzer winner) and "Hawaii"(critically acclaimed); which deal with the phenomena from a historical Hawaiian perspective in great detail. Although disease was probably the primary factor, as other answers have addressed, there was another factor that negatively impacted the native population of Hawaii: emigration. Hawaii was an important stopping point for trade vessels. It was not uncommon for ships to take on board Hawaiians as laborers in various roles. Many, of them never returned, but they left their mark in far flung places. For example, there is a county, a river, and a range of mountains in southwest Idaho called Owhyee. It's name comes from the history of Hawaiians that accompanied the fur trading parties operating out of the northwest coast. In 1840, Kamehameha III, faced with the seeming threat of racial extinction due to depopulation by both emigration and disease, enacted a law that required captains of vessels desiring to board Hawaiians to obtain the written consent of the island governor and sign a $200 bond to return the Hawaiian within the specified time. "About a thousand males in the very prime of life are estimated annually to leave the islands, some going to California, others to the Columbia, and many on long and dangerous voyages, particularly in whaling vessels, while a considerable number of them are said to be permanently lost to their country, either dying during their engagements, or settling in other parts of the world." Governor Simpson began to worry about the number of Hawaiians employed in the Company service and in 1842 ordered McLoughlin to hire no more. McLoughlin, faced with problems of increased production, disagreed and disobeyed the explicit order and hoped the home office in London would understand the necessity and overlook this breach of discipline. Besides the whaling vessels and the northwest fur trade, early California was another destination. John Sutter (of Sutter's mill where the Gold Rush began) brought several men and women with him from Hawaii, who were indispensable in helping him set up his operation when he first arrived. After gold was discovered, his workers were anxious to go to the mountains and dig gold. I consented, got a number of wagons ready, loaded them with provisions and goods of all kinds, employed a clerk, and left with about one hundred Indians, and about fifty Sandwich Islanders (Kanakas) which had joined those which I brought with me from the Islands. The first camp was about ten miles above Mormon Island, on the south fork of the American river. For the most part, these Hawaiians did not return to Hawaii. Many married into the Native American Miwok tribe, who recognize their Hawaiian ancestry to this day. To add to the existing good answers, it's important to remember that during the period of population decline, disease was far more readily spread and dangerous than it is today. Vaccination did not start to become commonplace, even in advanced countries, until the middle of the nineteenth century. Antiseptics first came into use in 1867, and took years to reach backwater places like Hawaii. The first sanitation system in Hawaii started being built in 1899. The first antibiotics were discovered in the early twentieth century. We forget too easily just how squalid and dangerous life could be in the past, especially if you weren't rich. Not the answer you're looking for? Browse other questions tagged demography pacific-islanders hawaii or ask your own question. What percentage of the population in the Thirteen Colonies in 1776 were first/second generation immigrants? What caused the rapid African population growth in the last decades? Why did the Eastern U.S. population decrease so much during WWII?